A few weeks ago I posted about the packs I've used on long-distance walks. As that proved popular here's a round-up of the various shelters I've chosen over the years. 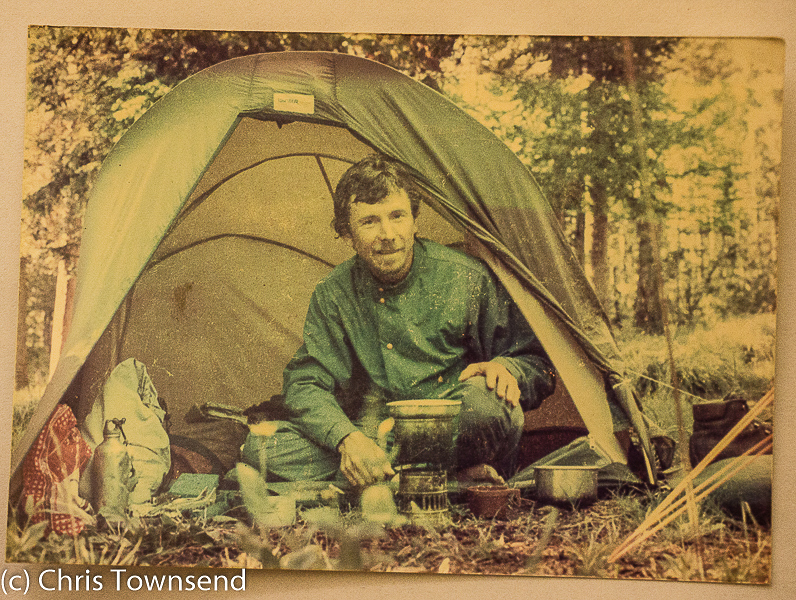 Starting out with ridge tents I then went to domes and hoops as curved poles became standard and then back to ridge tents when designs arrived that could be pitched with trekking poles. Most recently I've abandoned tents altogether and gone for shaped tarps. The tents I used in the early days would still be fine now though. What's changed is the materials. Modern shelters weigh less for the same space whilst being tougher and more durable. 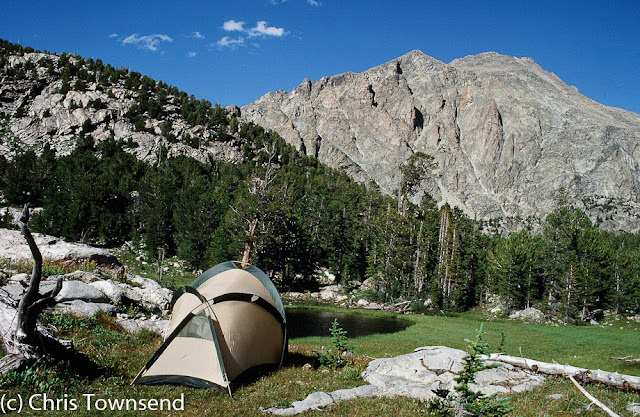 My first backpacking tent was a single-skin ridge tent with no vents and no porch. The condensation was horrendous! I never used it on more than two-night trips. Next came a Saunders Backpacker II sloping ridge tent which was double-skin and had a big porch. I took this on the Pennine Way in 1976. Whilst it performed okay the sides did bellow in and out in strong winds as they were unsupported. 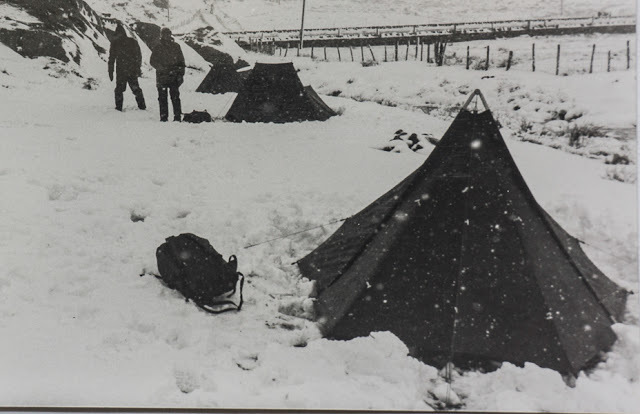 Wanting a more stable tent for my first really long walk, Land's End to John O'Groats in 1978, I chose another sloping ridge tent but one with side guylines and an A-pole at the front, the Ultimate Tramp. This proved excellent. I wasn't a photographer when I did that walk - my cheap compact camera broke in the first few weeks - so I have no pictures of the Tramp from it. I did find the photo above in a box of old prints, taken a year later, by which time I'd acquired another camera. Both those ridge tents weighed around 1.8kg and had polyurethane coated flysheets that weren't that durable. As I didn't think the Tramp would last another long walk I looked for something else for my next trip. I also admit to being seduced by the new flexible pole hoop and dome tents that arrived around 1980 and which gave more space for the weight and it was one of these that I chose for the Pacific Crest Trail in 1982. The Wintergear Eyrie was a two pole dome tent with a third pole for the porch. It was also single-skin and made of Gore-Tex. In the dry conditions of most of the walk it worked really well but in rainy and snowy weather in the Cascade Mountains near the end of the walk there was rather too much condensation for comfort. It was quite heavy at 2.26kg but very roomy and easy to pitch. The tent didn't last much longer than the walk though as soon afterwards it leaked badly in a Scottish downpour. 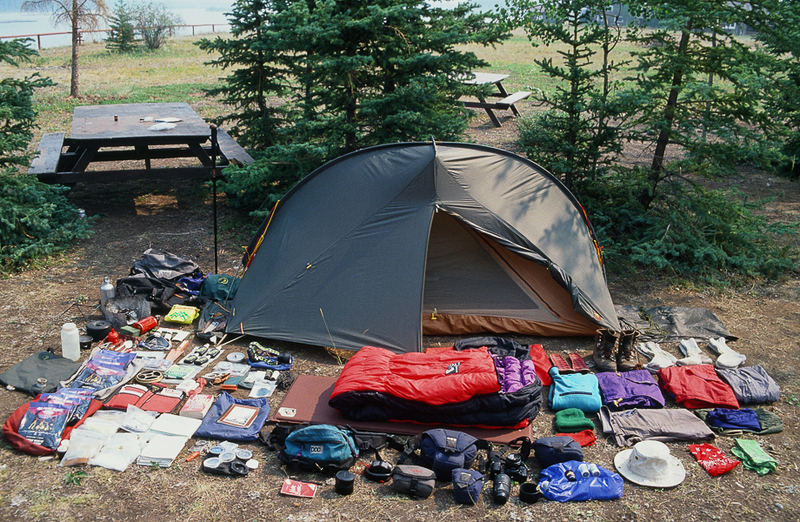 It was the only time I ever used a single-skin tent on a long walk. I used another Wintergear tent, the Voyager (still available from Terra Nova), on the Continental Divide Trail. This three-pole semi-geodesic dome was very stable and roomy but also quite heavy at 2.7kg. For the first 500 miles it housed two of us as my friend from the PCT Scott Steiner accompanied me. After that I had to carry it myself. 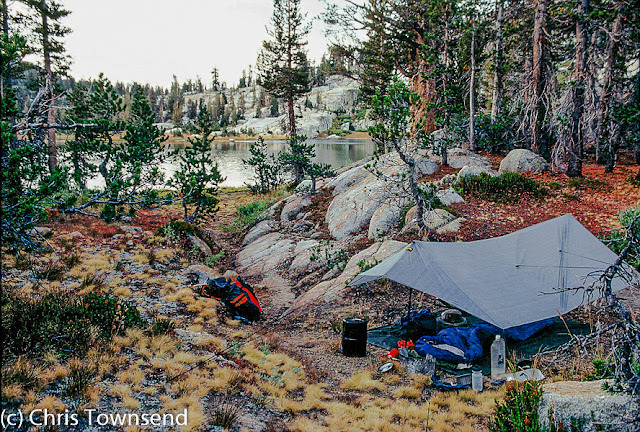 It was the first time I'd used a tent that pitched inner-first, which was useful on nights when I wanted shelter from bugs or a breeze but rain was unlikely. Using just the inner there was never any condensation. For my next two long walks, the length of the Candian Rockies and the Yukon Territory south to north, I chose a tent from a new British company, Phoenix Mountaineering, the successor to Ultimate, whose Tramp I'd used a decade earlier. This was the first single hoop tent I'd used and I liked the space, the weight (1.8kg) and the stability, even if the nine guylines could get tangled. The Phreeranger is the only tent I've used on two long-distance walks. I really did like it! After four North American walks I returned to Europe for my next one, the Scandinavian mountains from south to north. 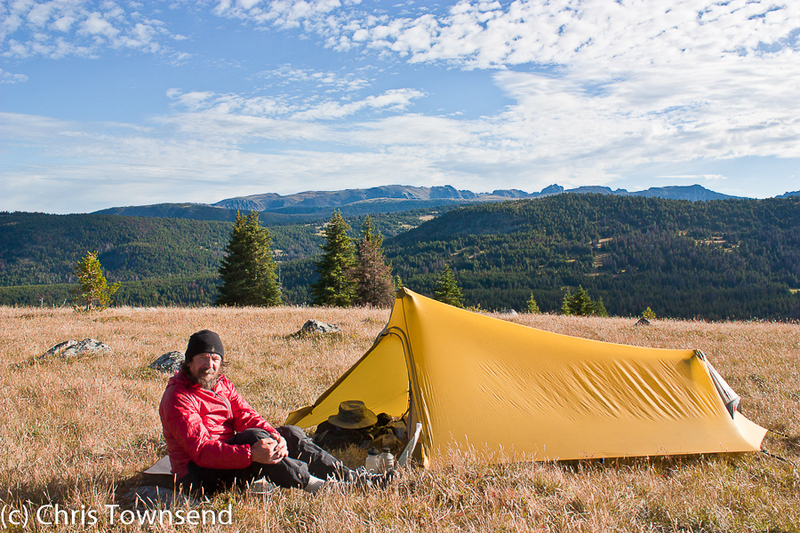 Appropriately I chose a Scandinavian tent for this, the Nallo 2 from Swedish company Hilleberg. This two-pole tunnel tent weighed 2.2kg and was very roomy and stable. It needed to be the latter as this was by far the stormiest long walk I'd done so far. (It was soon to be surpassed). Like other tunnel tents it was best pitched rear to the wind for stability. There was one night when the wind changed and started pushing the sides of the tent against me and flexing the poles alarmingly. I got out into the black wetness and turned the tent ninety degrees. The shaking stopped and I went back to sleep. 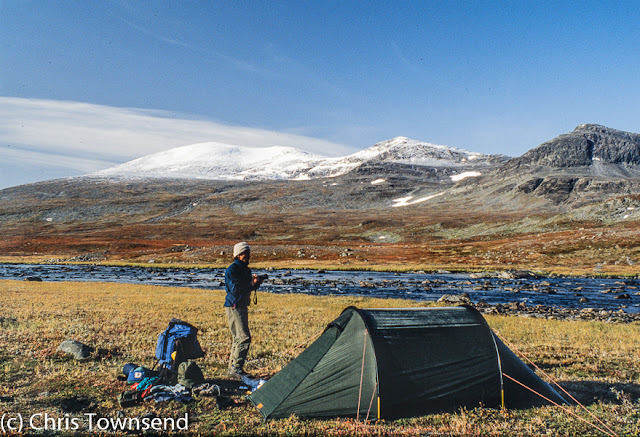 The Nallo 2 was the first tent I used with a silicone nylon flysheet rather than a PU coated one. Every shelter I used after the Nallo 2 was made from this light durable material. 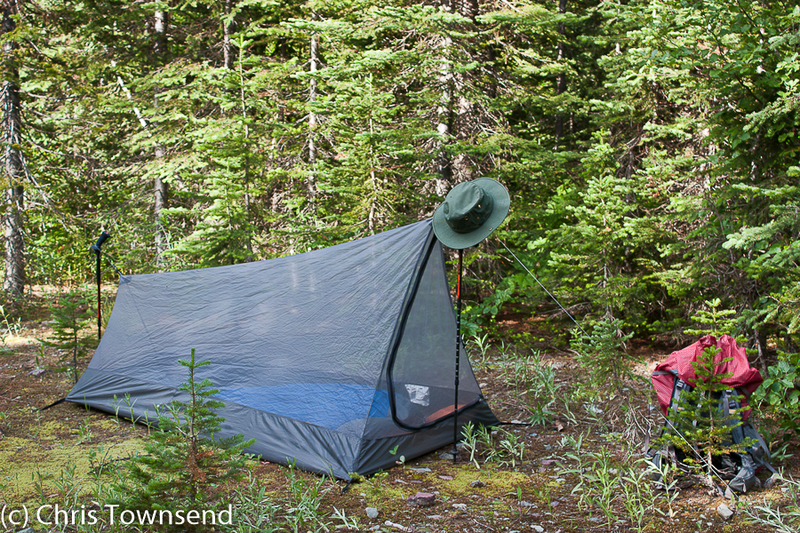 I loved the Nallo 2 and I was impressed with the quality but I did wish it weighed less. At the time it was the lightest tent Hilleberg made. However not long after my Scandinavian walk the company introduced a solo tent that has been one of my favourites ever since, the Akto. This single-hoop tent weighed 1.7kg (the current version is made from lighter materials and weighs a little less). 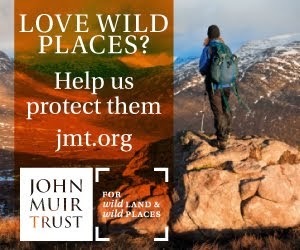 I chose it for my walk over the Munros and Tops and really tested it as this was even stormier than the Scandinavian Mountains walk. The Akto came through fine and I've since used it on many Scottish walks, including several TGO Challenge coast-to-coast crossings of the Highlands. After two wet and windy walks I wanted to go somewhere warm and dry for my next trip. I'd really enjoyed the desert sections on the PCT and CDT so a return to the SouthWest USA seemed a good idea. After the Munros and Tops walk I did a two-week trip in the Grand Canyon with the Akto and realised that excellent though this tent was it wasn't needed for a desert walk where rain was very unlikely and I could sleep under the stars most nights. 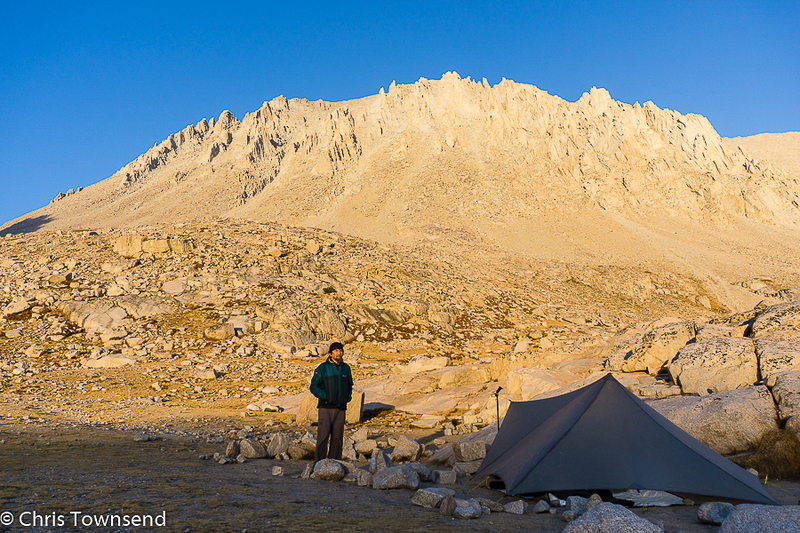 Also, I was now using trekking poles regularly and wanted to use them as tent poles too to save some weight. Designers hadn't caught up with this idea yet. 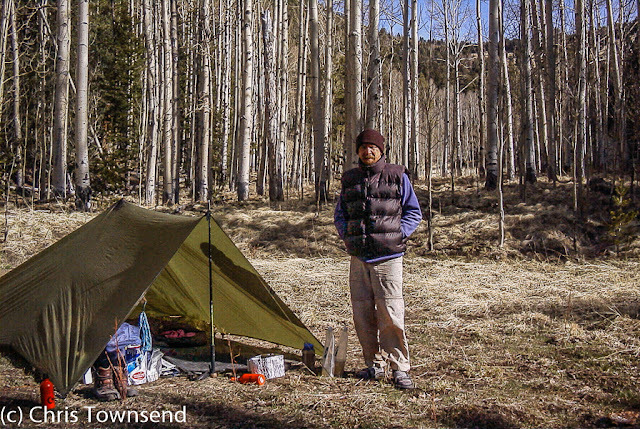 So when I decided to walk the Arizona Trail I looked for a tarp rather than a tent and ended up with a shaped one called the Kathmandu Trekking Basha-Tent, which could be pitched as a pyramid. With a groundsheet and pegs the weight was 1.2kg, far lighter than any tent I'd used yet it was also far roomier than any of them too. I used it to keep off the wind on quite a few nights, which it did very well, and just once some rain and wet snow. Having enjoyed using a tarp I took another one on my next walk, a 500 mile circular walk through the High Sierra starting and finishing in Yosemite Valley. I didn't reckon I needed the space or stability of the Basha-Tent so I took an even lighter tarp, the GoLite Cave. The weight with pegs and a groundsheet was 794 grams. Most nights I slept under the stars but I did pitch the Cave a few times when it looked like rain. Using trekking poles for pitching the tarp was a success so I was determined not to carry tent poles on future long walks. However my next long walk, the Pacific Northwest Trail, went through country where it could be wet and windy and where mosquitoes could be a problem. 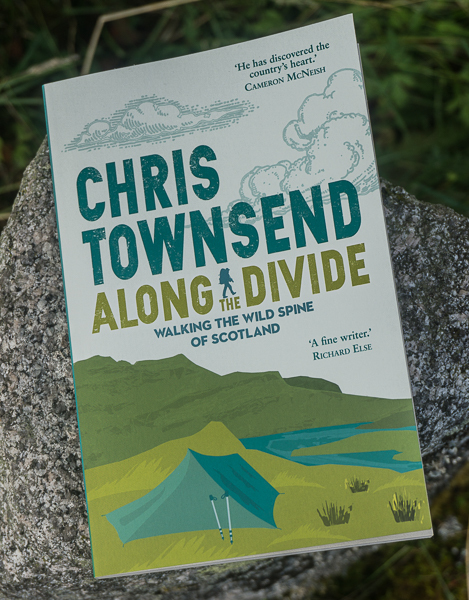 I wanted something with doors I could close so I went back to a tent, a sloping ridge tent in fact that looked very like the one I'd used on the Pennine Way over thirty years earlier. However because it was made of silnylon and could be pitched with trekking poles the GoLite Shangri-La 1 only weighed 963 grams. 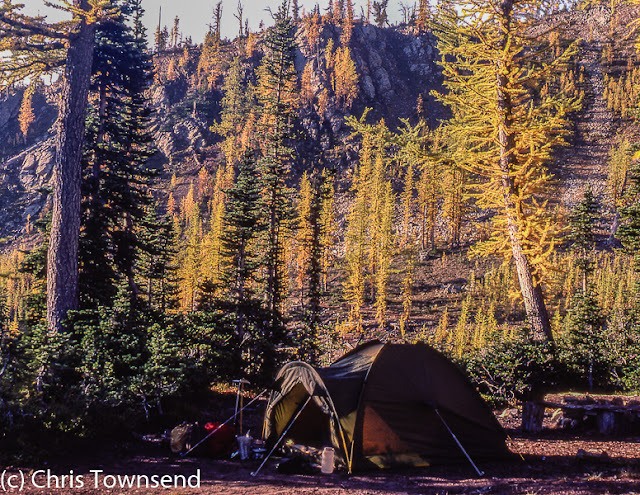 The Shangri-La 1 had an inner, the Nest, that could be pitched on its own, which I did at camps where mosquitoes were biting but there was little chance of rain, the first time I'd had a tent that enabled me to do this since the Voyager on the CDT 25 years earlier. As the Nest was made of mesh rather than solid nylon it was even better than the Voyager inner as it meant I could see out whilst safe from the bugs. I returned home for the next long walk, the Scottish Watershed. This high exposed route could be very wet and windy (it was) so I wanted a shelter that would stand up to big storms. I remembered how good the Basha-Tent had been in strong winds so I looked for something similar and found the Mountain Laurel Designs Trailstar, which is amazingly stormproof yet very light. Knowing midges were likely I paired it with an OookWorks mesh Nest, which could be hung inside. The total weight was 1.16kg and like the Basha-Tent the room was more than I needed. 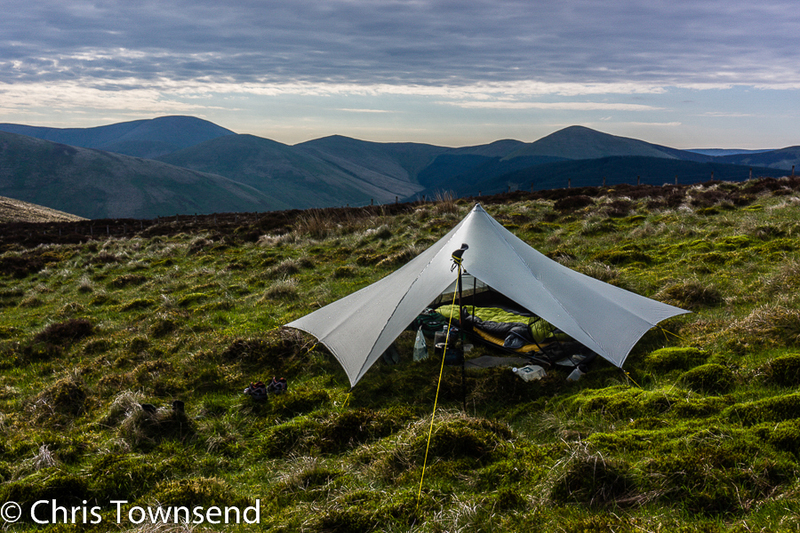 At times the weather was as wild as on any walk I'd done and I was very glad of the Trailstar's wind resistance. After the storms of the Watershed I fancied another dry walk so my next one was from Yosemite Valley to Death Valley. 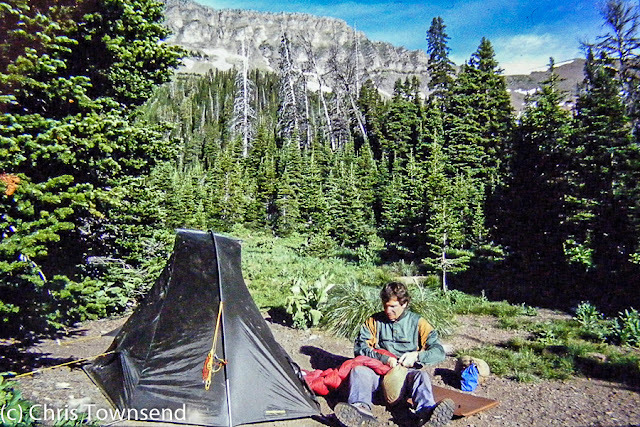 I hoped to sleep under the stars most nights and I didn't really need a storm resistant shelter like the Trailstar. I took it anyway as it had become a favourite and it was so light. 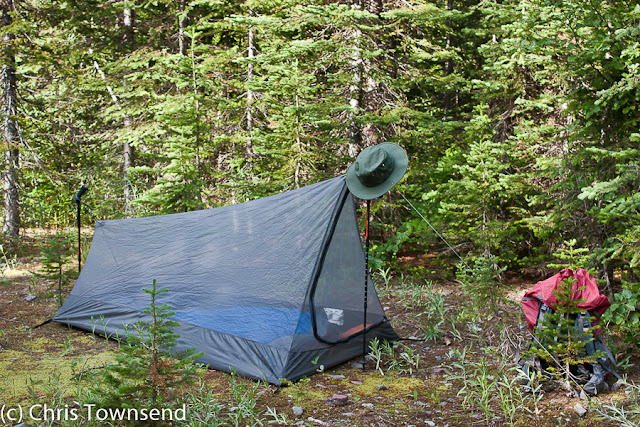 As I wasn't expecting mosquitoes I dispensed with the mesh inner and just took an ultralight Tyvek groundsheet. The total weight was just 801 grams. I did have some big winds in the desert that made the Trailstar worth carrying but overall I could have managed with an even lighter, smaller tarp like the GoLite Cave. My next walk? 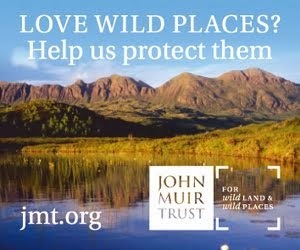 Probably the Trailstar again. Again very interesting to read! It looks like you've really settled for the Trailstar now because you have chosen it for the wet and stormy as well as for the desert. That first photo of you is great Chris! No. I do have a bicycle but I only use it for short local trips. I like walking! How come you didn't mention the Scarp 1, I thought that was one of your favourites. 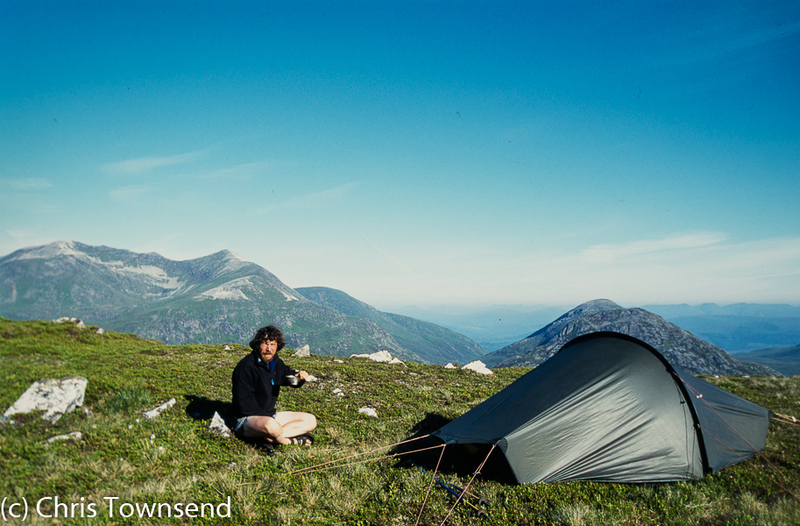 It is one of my favourites but I was only writing about tents I've used on long-distance walks, which I've arbitrarily defined as ones lasting a month or more (500 miles+)and I've never used the Scarp 1 on such a walk.